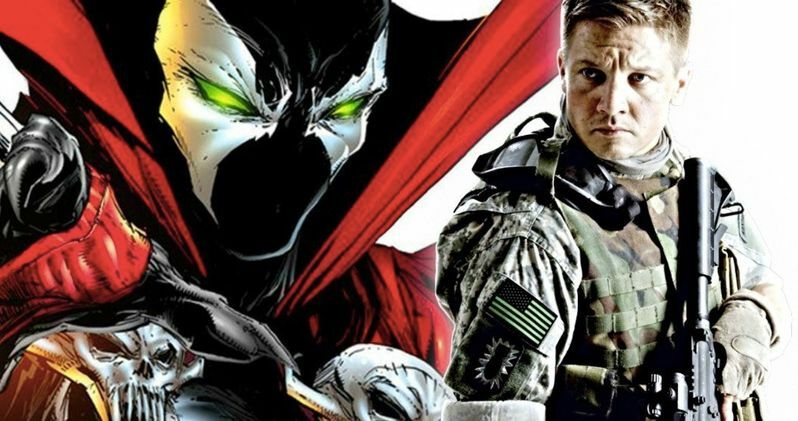 Jeremy Renner is reportedly in talks to play the lead in the upcoming Spawn reboot. Todd McFarlane, who created the character for Image Comics, wrote the script for the movie and will direct it, has seemed very ambitious with this project from the start. So far, that ambition has paid off handsomely, with Jamie Foxx recently boarding the cast as the titular character. Now it looks like Avengers star Jeremy Renner is in talks to star opposite Foxx as the movie's lead character Twitch. Todd McFarlane has previously compared the character of Spawn to Jaws. He's going to be lurking in the background, won't be featured on screen the whole time and, unless something has changed, may not talk much if at all. The lead character will be a detective from the comics named Twitch Williams, one half of a detective duo known as Sam and Twitch. That's who Jeremy Renner would be playing. Assuming this casting pans out, it would be a huge get for the movie. Even though he's primarily known as Hawkeye in the MCU, Jeremy Renner is a very respected and versatile actor. He was nominated for a Best Actor Oscar for his work in The Hurt Locker, which ultimately went on to win Best Picture that year. Not only that, but he's proved himself to be a bankable star. It certainly doesn't hurt that he's part of the biggest movie franchise ever. For Blumhouse, a studio that typically makes micro-budget movies often without big names attached, this is pretty huge. Todd McFarlane's enthusiasm and wishful thinking may have helped. He at one point said that he was using Leonardo DiCaprio as inspiration for the lead in the movie. Not to say that he was going after DiCaprio for the part, but that shows how high he has his sights set. McFarlane recently discussed going after his wish list of actors for the role of Twitch, determined to get the best cast he possibly can. "Do I have my wish list? Of course, I do. Do I think it's likely that I'll be able to get one of them? You know, I'm a realist. But, I didn't think I was going to get Jamie. But, I said, let's ask. What's the worst that could happen if they say no? Before I go anywhere, I'm going to go to my list. If they say no, then we keep moving." Casting Jamie Foxx and getting him on board surely helped matters in being able to entice one of the actors on that wish list. If this new report is to be believed, Jeremy Renner was on that list. Renner has nothing officially on his schedule following the release of Avengers 4 next year, so he should be free and clear to star in Spawn, should he so choose. Spawn does not currently have a release date. This news comes to us courtesy of That Hashtag Show.